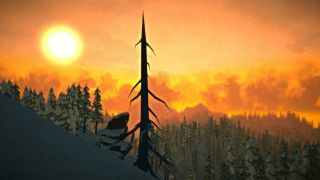 The Long Dark director: "don't put players in the driver seat"
While you don’t have to click far online to notice growing discontent with Early Access and Kickstarter, it’s harder to gauge how developers are reacting to it. In a GDC talk today, Hinterland Studio founder and creative director Raphael van Lierop chatted about the studio’s community-informed approach to The Long Dark, which has its feet in both camps: it was a successful Kickstarter campaign which made the transition to Early Access. “The risk [with Early Access] is that you’re living with other people’s mistakes, as well as your own,” van Lierop said. “One of the eye-opening experiences on Early Access is how much hostility there is towards it on Steam community. The Long Dark is among the most polished and fully-featured Early Access games, and that’s in part thanks to Hinterland’s approach to community feedback. While the very model depends on this feedback, van Lierop said the studio seeks “guidance, not direction” from funders and Early Access participants. “The community doesn’t belong in the driver seat,” van Lierop said. “[The community] is a tool, a data point, a voice to listen to, but they haven’t spent years of their lives doing this job. I know it’s an unpopular way of approaching it, but my opinion is that if you do [allow the community in the driver seat], you’re not going to have as strong an expression of your creative vision. We’re getting a lot of benefit from the community and we’re not about ignoring the community, you just incorporate the ideas. It's important for a studio not to take online feedback to heart, and to maintain an internal consultative approach. “There can be so much feedback that at some point you think ‘I don’t know what to do there are so many people talking to me’," van Lierop said. "Sometimes the community’s feedback can start to sway your team, because they’re reading the forums too, and if they see something in the forums about their particular area of the game, they might be really influenced by that and want to change it. But it’s important to talk about it and not be pulled back and forth by one or ten forum comments." Van Lierop also confirmed that when The Long Dark launches proper later this year, the story-driven game mode will launch alongside it.